The Immigrant and Refugee Community Organization of Manitoba (IRCOM), which is an organization that operates an apartment complex located in Winnipeg’s inner city, stands out as an exemplary and innovative model in the fight to seek sustainable and healthy housing solutions as it builds inclusive communities and contributes to positive outcomes for low-income families. Many studies find that newcomers’ struggles to find affordable and good quality housing are related to such challenges as lack of employment, low incomes, discrimination, and language barriers. Therefore, newcomers all too often accept substandard living conditions as they navigate these difficulties. In addition to housing, newly arrived immigrants and refugees require a host of supports and services to gain the knowledge and tools necessary to settle. They require assistance with job searches, credential recognition, language learning, and so on. There are many organizations that offer general and specialized assistance to newcomers, but there is a paucity of efforts that link settlement with housing, despite the centrality of housing in newcomers’ settlement and integration process. In an effort to address the challenges commonly faced by newly arrived immigrant and refugee families, IRCOM officially established in 1991, focusing on addressing a gap in the settlement services landscape at the time by providing resources and supports to newcomer families. Now, IRCOM provides affordable transitional housing with wrap-around supports for low-income, predominately refugee, newcomer families. The building consists of 67 two or three bedroom suites available to rent for a maximum three-year stay. Affordability is achieved through a rent-geared-to-income model, which ensures that newcomers do not pay a disproportionately high percentage of their income on housing. The housing and rent subsidy at IRCOM is provided through a sponsor management agreement with Manitoba Housing and Renewal Corporation (MHRC). Recently, IRCOM opened a second location to address increasing demand for affordable housing. Working closely with MHRC and the provincial and federal governments, IRCOM can now offer additional housing options to newcomer families. In addition to housing, IRCOM provides wrap-around supports within the apartment complex. These supports include an array of programming and services such as after-school resources for children, financial literacy workshops, needs assessments and referrals, and many other specialized learning opportunities for newcomers. The organization’s holistic model uses a supportive and empowering approach to provide immigrants and refugees with the tools needed to successfully settle and integrate into their new homeland. One of IRCOM’s main objectives is to create, support, and contribute to an inclusive and engaged community that exists both within and beyond the building. Within IRCOM, there is emphasis on a community-driven approach that includes input and feedback from tenants through regular meetings and the appointment of tenant leaders who act as resources for both staff and tenants. Beyond the walls of the building, community-based partnerships and collaborations contribute to programming and services offered through IRCOM. Meaningful engagement with the wider inner-city community provides tenants with opportunities to be involved in a larger neighbourhood. Many of the supports that IRCOM offers are also available to newcomers living in the wider community, which contributes to a community-based approach to inclusivity. IRCOM provides essential services to a vulnerable population that would most likely otherwise be pushed into substandard, expensive, and insecure housing as they navigate the complex process of settlement in their new, unfamiliar homes. Securing quality housing through IRCOM means that those fortunate families will avoid the negative effects of being precariously housed. Additionally, accessing wrap-around support services ensures that newcomers can ease into their settlement process within a supportive, empowering, and convenient environment. The families who live in IRCOM will not face the same initial housing and settlement challenges that are experienced by many other immigrants and refugees arriving to Canada, with the positive effects lasting beyond the end of their time at IRCOM. To this day, IRCOM appears to be a rare, if not singular, example of combining wrap-around supports with housing provision for newcomer families. 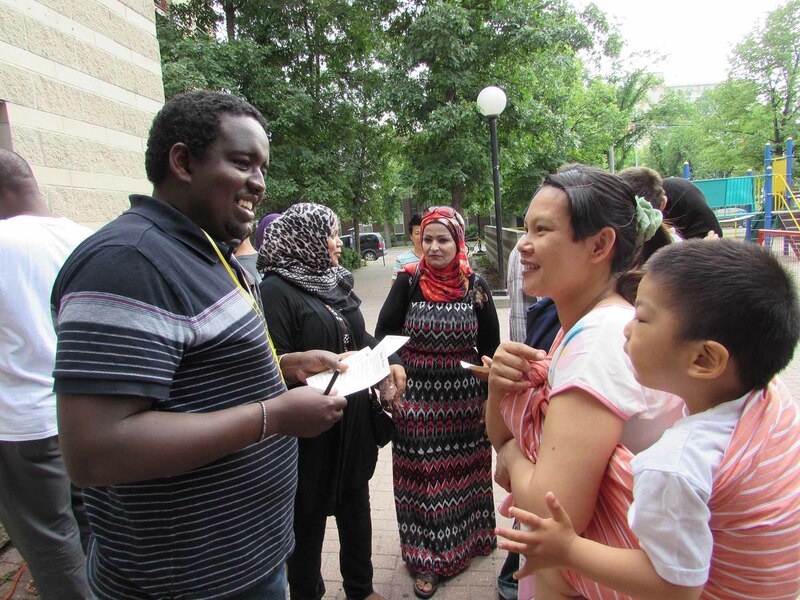 The model alleviates barriers to accessing settlement services and develops an intensive support network for newly arrived low-income immigrants and refugees while limiting their chances of encountering precarious housing situations. For these reasons it is worthwhile to consider the potential of community-based housing with supports models to ease the challenges faced by marginalized and vulnerable populations as they navigate the housing market. Dr. Jill Bucklaschuk is the Principal Investigator on a three-year study of IRCOM’s model. This fast facts accompanies the release of a new report, The IRCOM Model: Housing and Wrap-Around Supports for Newcomers in Winnipeg. This is the first of two reports studying the impacts of IRCOM’s model on tenant social inclusion. This research is funded by the Winnipeg Foundation and the Manitoba Research Alliance through the Social Sciences and Humanities Research Council (SSHRC).